Matt Weber was raised in Portage des Sioux, MO in St. Charles County. After graduating from Duchesne High School, Matt received a Bachelor of Arts in Political Science from Rockhurst University and a Juris Doctor from the University of Missouri-Kansas City School of Law. 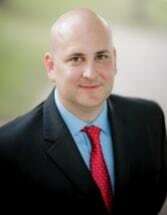 Once Matt graduated with his law degree, he returned to St. Charles County to open his law practice in Saint Peters. During this time at Weber Law Firm, Matt has been able to focus on the areas of law he enjoys and has gained many years of invaluable experience and knowledge. Weber Law Firm is a small, solo practice and that's how Matt intends for it to stay. He likes getting to know his clients on a personal level and provide personal invested representation in each of their cases. Matt wants to be the one to talk to you on the phone when you call with your first question and follow through with your case every step of the way. He will be the one handling your case in court if needed. Matt lives in St. Charles with his wife and children. He enjoys spending time with his family, biking, and competing in triathlons. In 2013, Matt was an Ironman finisher.